A huge bald eagle, hovering over a large mound east of here, inspired prospectors to name the area Eagle in 1836. With the coming of the Milwaukee and [sic] Mississippi Railroad, the Village was platted by Kline, Putman & Sprague in 1851. Soon, businesses, houses, schools and churches sprang up here. 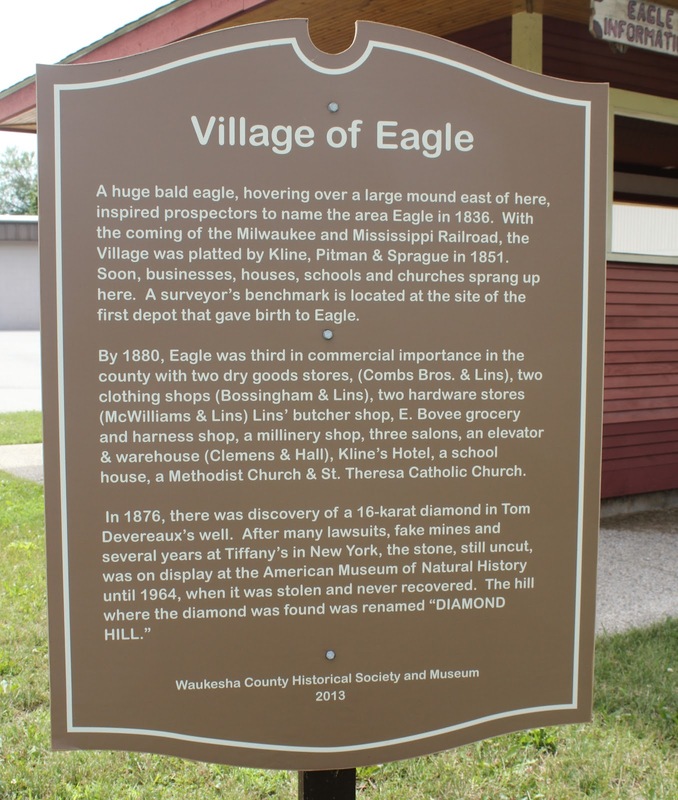 A surveyor's benchmark is located at the site of the first depot that gave birth to Eagle. 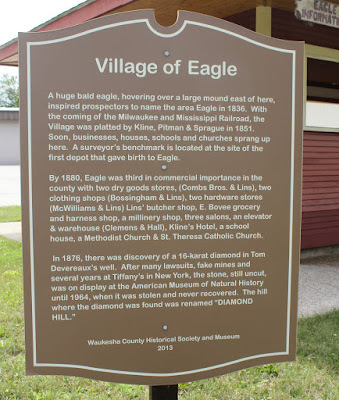 By 1880, Eagle was third in commercial importance in the county with two dry goods stores, [sic] (Combs Bros. & Lins), two clothing shops (Bossingham & Lins), two hardware stores (McWilliams & Lins) [sic] Lins' butcher shop, E. Bovee grocery and harness shop, a millinery shop, three salons, an elevator & [sic] warehouse (Clemens & Hall), Kline's Hotel, a school house [sic], a Methodist Church [sic] & [sic] St. Theresa Catholic Church. In 1876, there was discovery of a 16-karat diamond in Tom Devereaux's well. After many lawsuits, fake mines [sic] and several years at Tiffany's in New York, the stone, still uncut, was on display at the American Museum of Natural History until 1964, when it was stolen and never recovered. The hill where the diamond was found was renamed "DIAMOND HILL." Why, why, why, why, why wasn't the time taken to have this marker proofread!!!??? 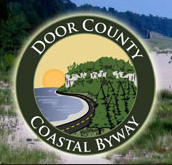 The marker, with all its errors in grammar, spelling and punctuation, is located in front of a small Visitor Information Center kiosk on eastbound Grove Street / Wisconsin Highway 59 / 67, at its intersection with southbound Partridge Street, at 222 Grove Street, Eagle, Wisconsin 53119. The marker above fails to note that for decades "The Eagle Diamond" was considered the largest gem found in America. The town received its name in a rather singular manner, as follows: In the year 1836, while Thomas Sugden, John Coats and a Mr. Garton were prospecting, they came to a beautiful prairie about one and a half by two and a half miles in area. Here, hovering and curving over a large mound, near the present residence of Ebenezer Thomas, was a monster bald eagle. From this incident and time, the prairie and town were called Eagle. The country, in its natural state, was diversified by springs, brooks, marshes, prairie and burr oak openings. The arable soil is slightly variable in composition, being, for the most part, a rich loam and gravel, and is quite productive. A chain of bluffs passes through the northwest part, but the greater part of the land is tillable. Here, as elsewhere in the county, the inhabitants suffered the deprivations incident to pioneer life, which have become the subjects for many an evening tale. When A. R. Hinkley brought his family in 1838, he put them up in a space 12x16 feet with two beds, a pine table, a rotating-top stove, four chairs or stools, a large box for bedding, five barrels of flour and one of pork. This single experience but illustrates the trials and inconveniences to which all were subject. Mrs. Bovee is said to have been the first person who died in the town of Eagle. In 1837, Jerry Parsons built the first "regular hotel". The first store in the town was started by Mr. Scofield, in 1844, in Eagleville. He also became the Postmaster. 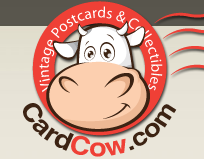 Previous to this time, the people were compelled to go to Mukwonago to get their mail. The Methodist Episcopal Church was the first church that held regular services and had a Sunday school. It is told of one of the early ministers, a Mr. Moultrop, from Canada, a very able preacher, that he made application to Messrs. Long and Cross for a picket fence around his yard, and carpet for his floor. They were very indignant at the demand, and replied, "We have no carpets nor picket fences, and if you preach for us you can't have any either." He didn't have any -- at least, not in Eagle. It is said of Miss Cross, who married Jonathan Parsons, in an early day, that after her marriage she used to sweep the floor of her log house, and dust her pine table, wooden chairs, and mud-chinked walls; with cap and gloves on, to the infinite amusement of her less fastidious neighbors. Cheese manufacturing was begun in the town in 1875, in a building constructed for the purpose of making burial cases, but which was never put to its intended use. This marker is No. 07-01 in a series of historical markers erected by the Waukesha County Historical Society. it's pretty much facing the marker. (the marker is visible to the right of the kiosk).